Book hotel rooms online with us at Pestana Delfim Beach & Golf Hotel - All Inclusive at the lowest rate, guaranteed. Get a holiday discount room rate at the 4 Star Pestana Delfim Beach & Golf Hotel located at Falesia east of Albufeira in the Algarve. The hotel with an All Inclusive Rate (breakfast, lunch, and dinner buffet, as well as snacks, ice-cream and national beverages), is ideal for those who want to spend their vacations in Algarve. The complex has 312 holiday bedrooms providing accommodation from two adults to two adults plus two children. 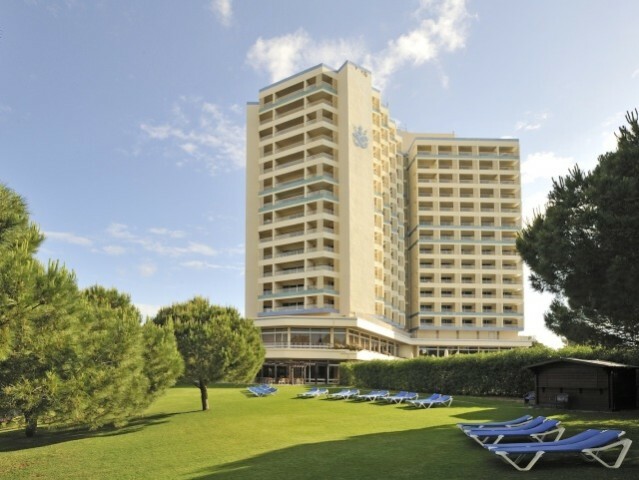 The Pestana Delfim Beach & Golf Hotel is situated in a large resort and only 50 metres from the sandy Alvor beach and enjoys great views of the ocean. The various apartments are air-conditioned and are equipped with balconies some with sea views, satellite TV, direct dial phones, internet access, terraces and a safe. Pestana Delfim Beach & Golf Hotel have many facilities in its immediate surroundings which include restaurants, bars, an outdoor pool for adults and a separate pool for children, an indoor pool, Fitness Centre and Jacuzzi, Turkish bath, a Spa with treatments and massages, games room, mini-golf, Tennis Centre, Kids Club, and free Wi.Fi in public areas.